It’s time for the Rebel family to unite behind our Texas Rebels and all victims of Hurricane Harvey. The Ole Miss Alumni Association Collection Point at Triplett Alumni Center, is a drop-off point for items needed by storm victims. Items needed include cleaning supplies, first aid kits, bleach, rubber gloves, hand sanitizer, towels (new), diapers and baby wipes, baby formula and dry pet food. (Charities are asking not to send bottled water or used clothing at this time). Bring items to Triplett Alumni Center before the UT Martin game on Saturday, Sept. 9, from 8:30-10 a.m.
• Houston Rebel Club: Our Houston Rebels are hosting donation drives at their watch party locations on Saturday to help with Houston relief efforts. For a list of watch parties, click here. • Rebel Relief: The University of Mississippi Foundation has established a fund that will directly aid students affected by the storm. To make a tax-deductible donation, click here and specify “Rebel Relief Disaster Fund” in the comment window. 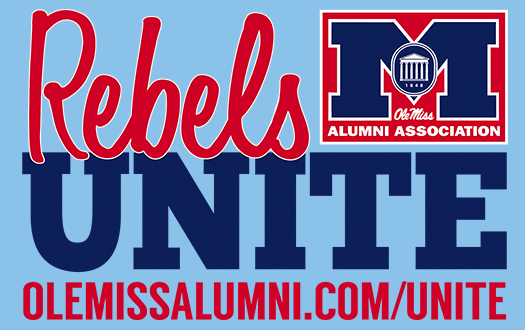 • The Shirt 2017: Through Sept. 15, $10 from each sale of The Shirt will go directly to the Houston Rebel Club’s scholarship endowment. Click here to purchase a shirt. • American Red Cross: To make a financial donation, visit their website, call 1-800-RED-CROSS or text HARVEY to 90999 to make a $10 donation. • Hurricane Harvey Relief Fund: The fund is administered by the Greater Houston Community Foundation. To make a tax-deductible donation, visit the GHCF website. • Salvation Army: To make a financial donation, visit helpsalvationarmy.org, call 1-800-SAL-ARMY, or text STORM to 51555. • Houston Food Bank: A tax-deductible donation will help feed victims. Click here to donate. • Texas Diaper Bank: The Texas Diaper Bank is working to meet the basic needs of vulnerable babies, children with disabilities and seniors. To make a tax-deductible contribution, click here. Looking to help in another way? CharityWatch’s listing of reputable aid agencies is a great place to start. Help us show we have the most charitable alumni base in the nation. Thank you for uniting behind our Texas Rebels and everyone affected by the storm! Hotty Toddy!